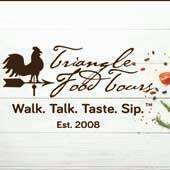 Join Triangle Food Tours for a fun, casual way to sample the sights, sounds and flavors from a cross-section of local restaurants and venues in downtown Raleigh. Triangle Food Tours journey with a small, guided group of enthusiastic guests that gain a sense of the history, culture and culinary vibe that flourishes in downtown Raleigh. The tour allows guests to casually experience and connect first hand with several unique, hidden culinary gems that will surely result in return visits with friends and family. Experience a guided culinary journey of sight and taste that spans a variety of downtown eateries to sample a cross-section of Raleigh’s unique locally-owned restaurant venues, blended together with some forgotten historical tidbits that leaves you full of new insights on the downtown culinary landscape. On the tour you’ll also learn how Raleigh became a Capital city born in a bar and why Sir Walter Raleigh is Raleigh’s most mysterious visitor and much more. It’s fun, informative and delicious. On this 3 hour tour you’ll be stopping numerous times for sample tastings and inside stories from 5 local establishments.